Replace missing teeth with realistic prosthetics. There are many ways to replace missing teeth with realistic prosthetics that are convincing to the eye and touch. However, if you’re missing most or all of your teeth, then removable dentures are likely the best solution. 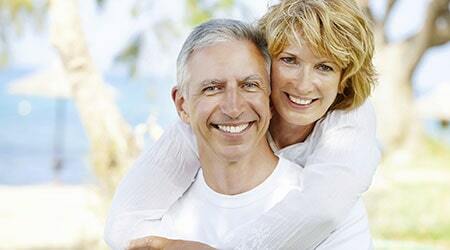 After replacing missing teeth, you will notice many benefits including improved speaking clarity, an easier time chewing foods, relaxed facial muscles, plus the confidence to always feel your best! Will I need to see a dentist after getting dentures? It will still be important to visit your dentist after receiving dentures. Initially, your dentist will do tests to ensure that the dentures conform perfectly to your mouth. In the future, your dentist will make sure that the dentures are still right for you as your facial muscles continue to change throughout your life. You should still take care of your dentures to ensure fresh breath, gum health, and overall hygiene. You are advised to wash your dentures along with your mouth and tongue after each meal. Make sure to avoid dropping your dentures or storing them in excessively hot areas. By taking care of your dentures and continuing to see your dentist, you will have a great smile for life! The best dental experience I've ever had! Staff is super friendly professional & make you feel comfortable! I highly recommend this office you won't go wrong!